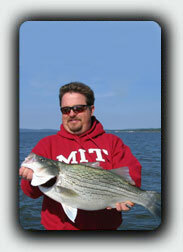 Oklahoma's lakes and rivers provide some of the best Striped bass, Crappie, and White Bass fishing available today. Whether you're trying to land a fish of a lifetime or just want to fill the live well full of Crappie. The knowledge and experience of your fishing guide can make the difference between a productive day of fishing and a waste of valuable fishing time. With lake and weather conditions constantly changing, water levels rise and fall in cycles. This change can be either natural or man-made. Having a guide who can pinpoint the best time and place to fish is what makes having a fishing guide so much more productive. "Die hard fishermen know if you want to catch fish, you go where the fish are!" If a true trophy Striper is what you're really looking for, in my opinion, both the Lower Illinois River, below Lake Tenkiller, and the South Canadian River below Eufaula Dam are the hottest of all our state hotspots. 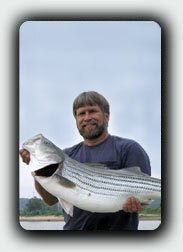 Although catching great numbers of fish there isn't likely, catching the Largest striper of your life is. 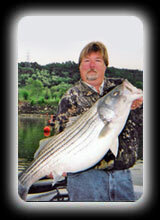 The current state record Striped bass was caught in the lower Illinois River below Tenkiller Dam. The prior state record was caught below Eufaula Dam and wasn't broken until just a few years ago. 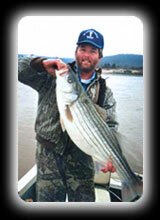 These two water ways produce some of Oklahoma’s finest Striped bass fishing. 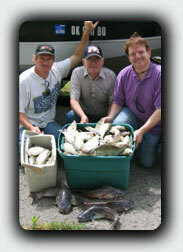 To see fish caught in the 25 to 35 pound range is not uncommon. Some folks even plan their vacation just to fish below Eufaula Dam. Striped Bass and White Bass love the swift moving water below the dam. Also caught in the river are the much sought after Saugeye, a Walleye/Sauger hybrid. These Saugeye are also caught frequently when trolling for White Bass in the lake itself. 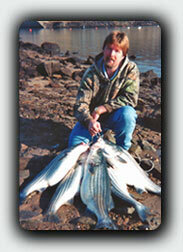 Lake Eufaula offers some of the best Crappie and White bas fishing in the state of Oklahoma. 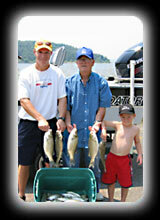 Eufaula Lake has an over abundance amount of Crappie and White Bass. Known nation wide to be one of the best Crappie fishing lakes in America. There are many ways of catching these fish. 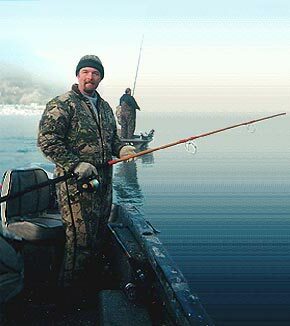 Your guide will teach you all the newest methods and fish catching techniques. Slow Trolling, Spider Rigging, Jigging, Dipping standing timber. You will learn them all! Just bring your lunch and proper clothing for an enjoyable day of fishing. 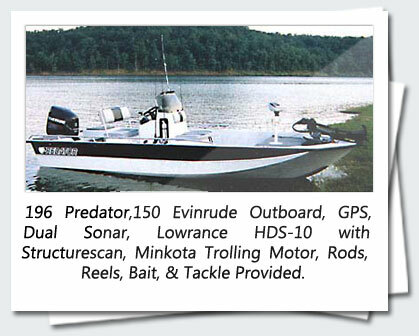 We provide all rods, reels, and tackle for your fishing adventure. Just ask the locals and they'll tell you the Crappie are biting. Once your guide finds the general areas they are feeding, the action is fast and furious. Often you can even catch two at a time! This type of fishing is Ideal for kids and experienced fishermen alike. Crappie are great to eat and provide plenty of action and this lake is full of them! Come spend a day with Larry's Guide Service - Over 25 years experience in fishing Oklahoma's waterways! Book Your Trip Early to Guarantee Your Spot! Special 2019 offer from Outdoor Adventure Guide Service.